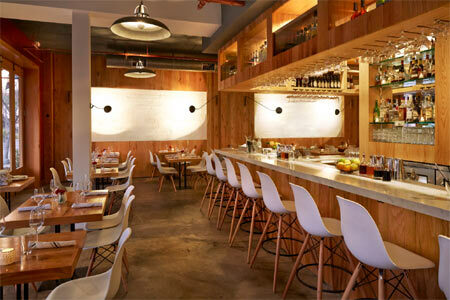 Salt's Cure has relocated to the former Ammo space in Hollywood. : The original Salt’s Cure location in West Hollywood charmed guests with its intimate dining space and open kitchen, but the new iteration on Highland Avenue is downright stunning. Wood-paneled walls and collapsible glass doors that lead out to a sizable patio create a stylish, breezy environment. There’s also room for 70 diners --- more than double the restaurant’s occupancy prior to its move. Other welcomed additions include a full bar with expanded cocktail options and longer food menus. The very popular weekend brunch still stars chef/owners Chris Phelps and Zak Walters’ oatmeal griddlecakes, plus the 2x2x2 breakfast plate: two eggs, two griddlecakes and two pieces of bacon or sausage. Lunch and dinner menus highlight the team's continued dedication to whole-animal cooking, offering chicken liver mousse and fermented Chinese broccoli over toast, for example, and a 16-ounce Marin Sun Farms pork chop. The daily special board is worthy of a look every day of the week as well. The wine list is a feather in the venue’s cap, as is its commitment to sourcing California ingredients from sustainable farms.